When an automotive brand offers two vehicles that appear similar, it can cause confusion on the market. Both the Sonic and Spark are two of the smallest vehicles to wear the coveted bowtie, and while they may appear similar to the untrained eye, they are actually quite different from one another. If you walk into a Chevy dealer in Albany, NY or anywhere else in the United States, and see a Sonic hatchback and a Spark next to one another, you may still have trouble figuring out their differences. With starting MSRPs that are only separated by a couple thousand dollars, these two sporty compacts are certainly worth defining, and taking for a test drive. Both the Chevy Sonic and the Chevy Spark are relatively new to the American market under their current names, but both compacts got their starts much sooner than most consumers are aware. The Spark technically came first, but was marketed as the Daewoo Matiz starting in 1998. The official Spark name did not enter into the official Chevrolet lineup until 2013, when it was first introduced as Chevy’s city car. 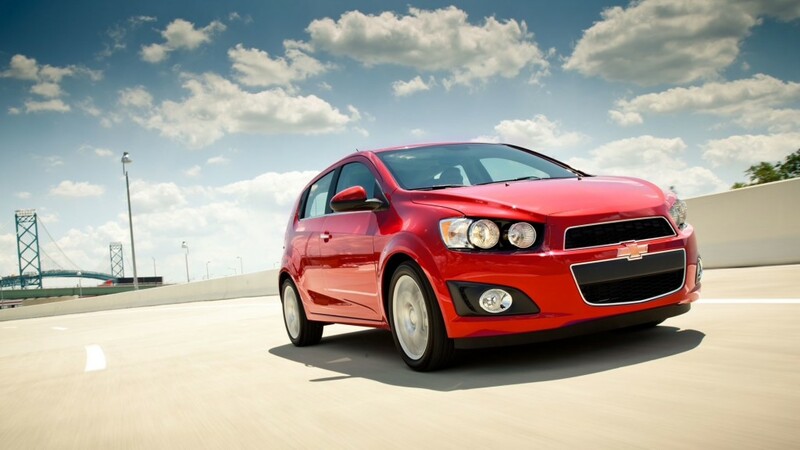 Similarly, the Chevy Sonic began under a different model name, the Aveo. Introduced in 2002, the Aveo was always sold under the Chevrolet brand, until it was renamed the Sonic for the compact’s second generation in 2011. While neither of these models got their beginnings under their current names, the Sonic and Spark are both models that have a proven longevity on the automotive market. Their uncertain semantic past may be one thing they have in common, but there are still plenty of aspects that keep these two cars on different playing fields. Now that we have touched on how these two cars are similar, let’s discover what makes them different. 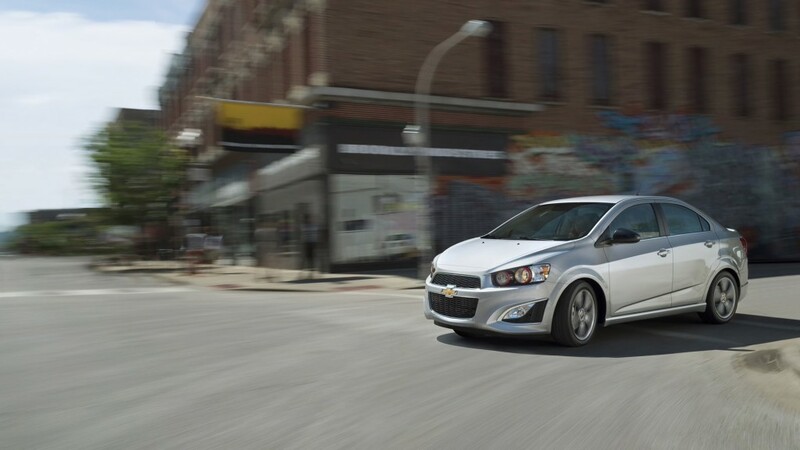 Check out the top 8 ways these two Chevy compacts prove they are worthy of their own model name. Price – The first noticeable distinction between these two cars is their pricing. The 2016 Sonic starts off at $14,345, while the 2016 Spark comes in at $12,660 to start. While both of these are under the $20,000 mark, the $1,685 difference can mean a lot for buyers in this segment. Body Styles – The Spark is offered solely as a five-door hatchback, while the Sonic gives consumers more flexibility with both a hatchback and sedan offering. The price difference between the two variants is minimal, and will cost drivers who want a hatchback right around $600 extra. Engine – The Spark comes equipped with a 1.4-liter engine, while the Sonic gets a slightly more powerful 1.8-liter block under the hood. Both engines are adequate for the size of the cars they power, but the Sonic does have a slight edge power-wise over the Spark. Size – Another area that separates these two compacts is their size. The less expensive Spark is also the smaller of the two cars, offering a maximum cargo capacity of 27.2 cubic-feet with the back seat folded down. The passenger capacity of the Spark caps out at four, while the Sonic offers seating for up to five passengers. The larger Sonic allows for a maximum cargo capacity of 47.7 cubic-feet with the rear seat folded down, which is a noteworthy difference compared to the Spark. Technology – The Sonic offers a bit less standard in-vehicle technology than the less-expensive Spark, which may be surprising to some drivers. Both the Spark LS and the Sonic LS base models come equipped with steering wheel mounted controls, OnStar for six months, and power door locks. The Spark offers quite a sampling above and beyond what the base Sonic offers drivers. The Spark comes equipped with a USB port, a seven-inch touchscreen driver information center, an auxiliary power outlet, a rearview camera, and an outside temperature display. 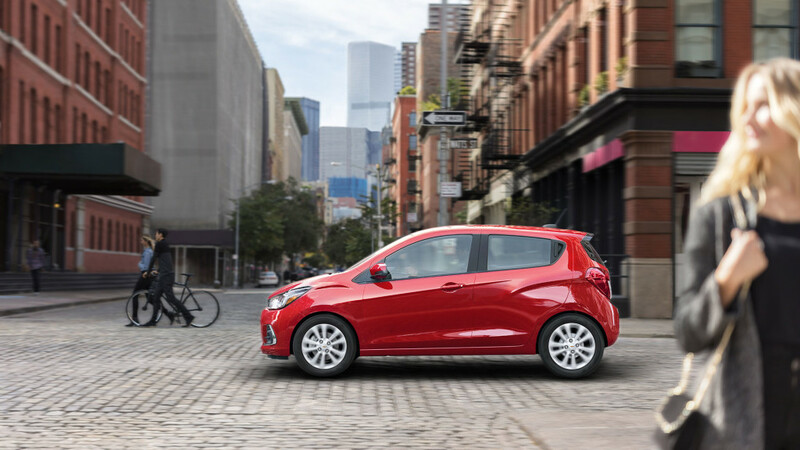 For drivers who want the latest technology and aren’t concerned about space, the Chevy Spark seems to be the more obvious choice. Fuel Efficiency – Both the Spark and Sonic were designed for ultimate fuel efficiency, both on the highway and in the city. The Spark gets an EPA-estimated 41 miles per gallon on the highway, and 30 miles per gallon in the city. The Sonic gets a still-impressive 35 miles per gallon on the highway, and 26 miles per gallon in the city. These numbers are not surprising considering the size difference between the two cars, so drivers are left to decide if size or economy is more important. Transmission – The Spark and the Sonic are both available with either a manual or an automatic transmission. Each of their three trim levels offer the option of both, and drivers can expect to pay around $1,000 more for the automatic over the manual for either of the two models. Trim Levels – The 2016 Sonic offers drivers the choice between four trim levels. With the least expensive starting at $14,345, and the most expensive starting at $20,095, there is a decent price difference that exists within the model offerings. The Spark offers drivers three trim levels to choose from, with the base starting at $12,660 and the most expensive model starting at $16,185. There is a much smaller gap that separates the Spark trim level prices, and it is obviously the most economically appealing of the two cars. Chevrolet offers drivers the unique opportunity to choose between two vehicles in similar segments. Both the Spark and the Sonic offer a variety of amenities and great fuel economy at a low price, and it is up to you to choose which one is right for your lifestyle. If you plan to use your compact car solely for commuting, and don’t need the extra passenger and cargo space, then the Spark is a great choice. For drivers who plan to haul passengers and cargo on a regular basis, the Sonic is likely the better option. 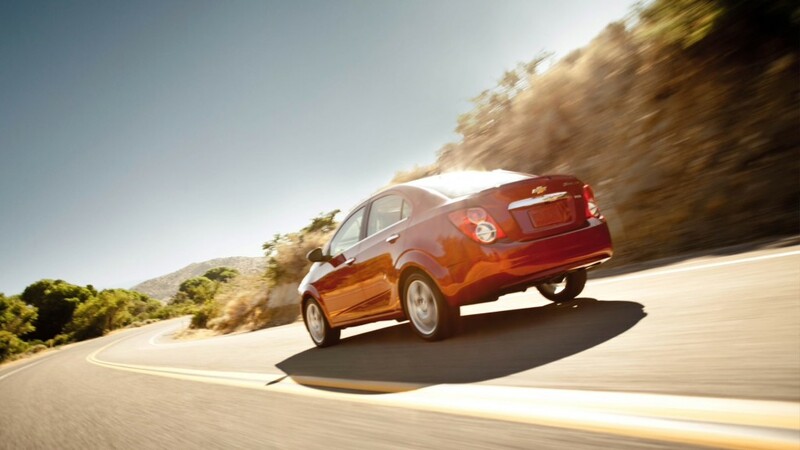 Both cars offer the same reliability and quality under the Chevrolet brand, and are both affordable for their class. When all is said and done, the only way to know for certain is to take one for a test drive today. After that, the choice is yours.